In our blog article on the the review of the year 2016, we referred to some seven new additions to the Singapore Checklist, bringing the total number of butterfly species observed in Singapore to 331. This weekend's article features four of these species and offers some insights on the status of these species in Singapore. Very often, we have migratory species that make their occasional appearance in Singapore and due to their seasonality, these are classified as 'seasonal migrants' in the Singapore Checklist. However, there are still some lookalikes that are hard to distinguish, except perhaps with physical voucher specimens or even using DNA barcoding to establish a distinct species that occurs in our environment. Then there is always the possibility that some species have eluded observation by hiding deep in Singapore's forested nature reserves. They are probably rare, but resident species, yet to be discovered or re-discovered. Amongst one of the surprising finds last year, was the Dark Jungle Glory (Thaumantis noureddin noureddin). A relatively pristine individual was found by NIE lecturer Assistant Prof James Lambert on the premises of the Nanyang Technological University. The butterfly was found dead with its wings spread open. The Dark Jungle Glory is described as being dark brown on the upperside with the wing bases a shining purple-blue, with a fascia of diffuse white spots on the forewing. The dark-greyish brown underside has a white post-discal line which is shaded with dark brown and a number of ocelli on the hindwing. The species is often found in bamboo thickets and fly close to the ground in dark heavily shaded habitats. It is curious that this species, considered a re-discovery is still found in Singapore after all these years. We do not believe that this is a seasonal migrant, as the Dark Jungle Glory stays in shaded habitats close to its likely caterpillar host plant of bamboos. It is probably rare, but has remained extant in Singapore in very limited habitats. It should be looked for in future, particularly in the NTU area which still has pockets of undisturbed heavily shaded forested areas. 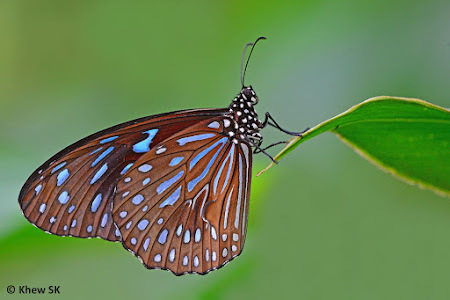 The next large species that has been observed in Singapore over the past years, is the Dark Blue Tiger (Tirumala septentrionis septentrionis). 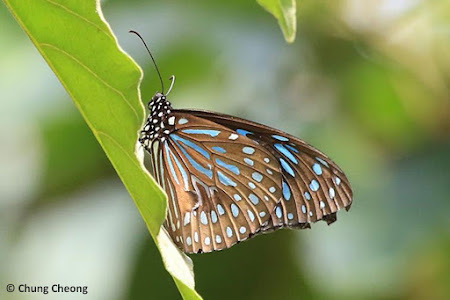 This butterfly, which resembles the Glassy Tigers of the Danainae subfamily, has been observed from time to time, and it was not until a confirmed shot by Chung Cheong was recorded recently. It was probably missed due to its resemblance to the Glassy Tigers and proved elusive. The Danainae have been known to be strong flyers and display migratory tendencies. That the Dark Blue Tiger has been sighted several times in Singapore, is therefore not surprising, as the tough "Tiger" can survive rough conditions that would have been fatal to other more delicate species. 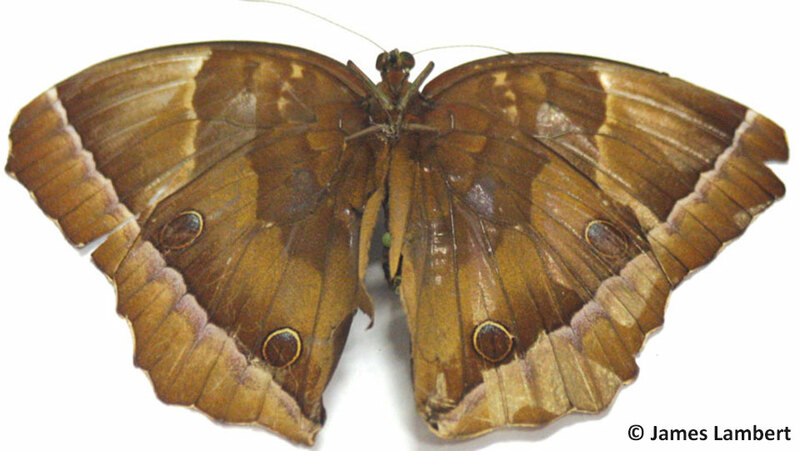 The species is not uncommon in Malaysia, and is often seen in butterfly enclosures where it is one of the farmed species for display. The Dark Blue Tiger is a large butterfly with narrow elliptical bluish markings. It resembles other species in the Parantica and Ideopsis genus but it appears much bluer in flight. 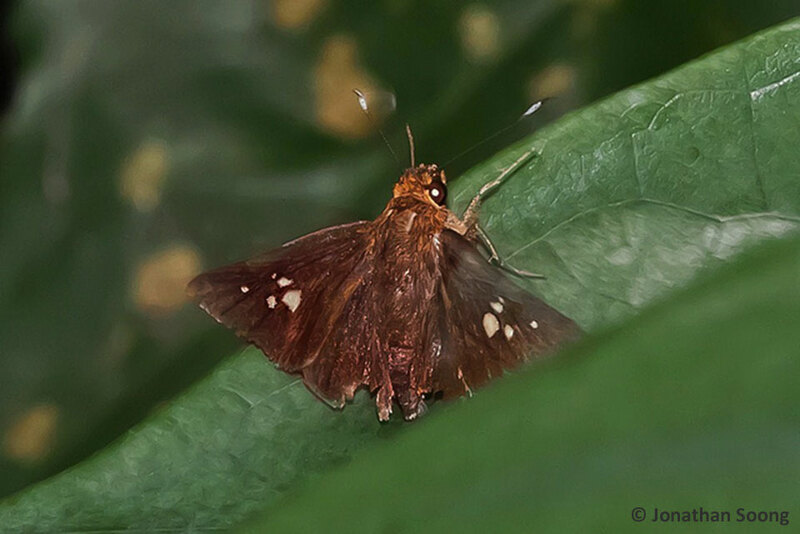 The next two species to be discussed are skippers from the Hesperiidae family. It is often challenging to identify skippers from field shots - particularly amongst the lookalike species, of which several species can be very similar in appearance. Amongst these are the species from the genus Potanthus and Telicota. 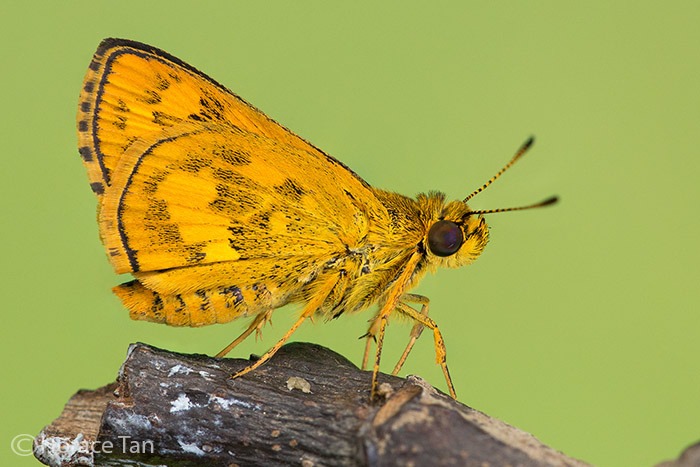 These orange-black skippers are small, skittish and appear frustratingly identical to butterfly watchers. 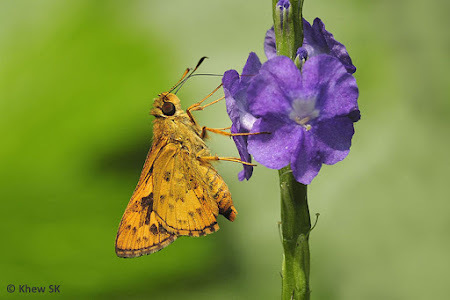 The species referred to as the Ganda Dart (Potanthus ganda). This species is of the same size and appearance as the more commonly found Lesser Dart (Potanthus omaha). However, the Ganda Dart prefers the forested areas in the nature reserves in Singapore whilst the Lesser Dart is more widespread and can be found in urban parks and gardens. 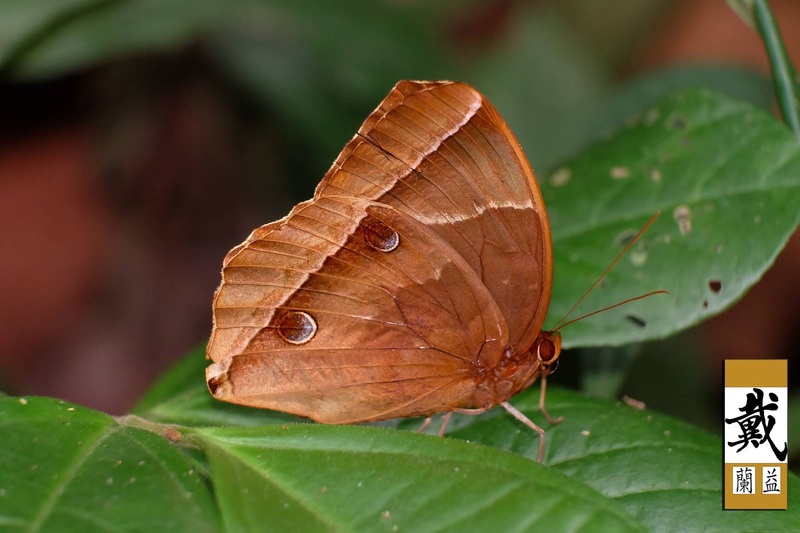 The Ganda Dart differs from the Lesser Dart in that the veins on the yellow band on the hindwing above are not blackened. It is also described to have deeper orange colouring (but a rather unreliable characteristic when comparing weathered individuals with pristine ones). 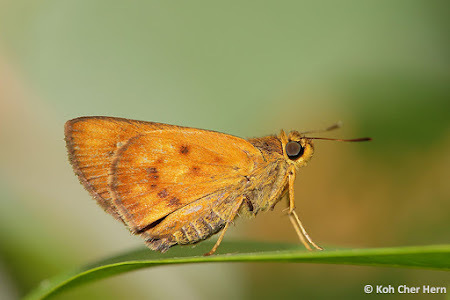 Both the Ganda Dart and Lesser Dart flies with the usual skittish skipper habits and often stop with their wings opened in the typical skipper fashion. 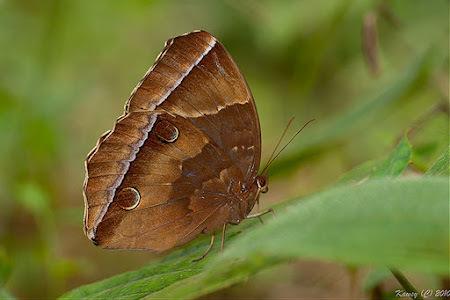 Photos of the Ganda Dart appeared online as early as 2010 but was not validated until recently, with breeding records. The next skipper of interest is the rare species from the genus Zographetus. These are forest-dependent butterflies and are rarely, if ever, found outside the sanctuary of the nature reserves in Singapore. Three species have been listed as extant in Singapore by the early authors. 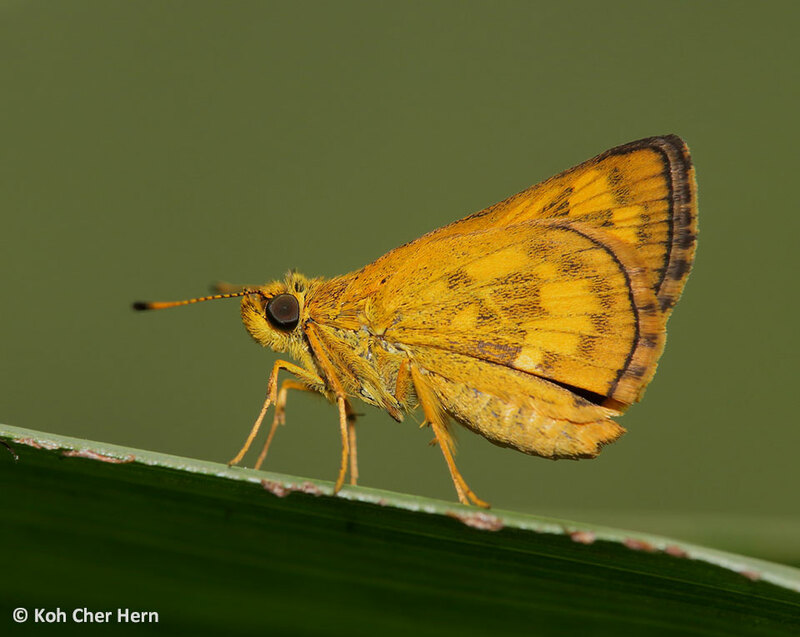 However, only one - Zographetus doxus (Spotted Flitter) has been recorded with certainty. 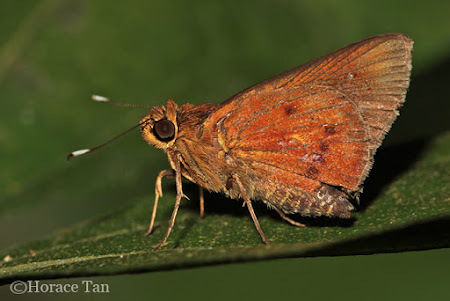 Over the years, another closely related species, the Rusty Flitter (Zographetus ogygia) has been photographed but not included in the Singapore Checklist due to the uncertainty relating to their superficial features. However, as more and more evidence appeared, the confidence level of distinguishing these two species has risen and therefore the 2nd species Zographetus ogygia has been added to the Singapore Checklist. A 3rd species, Zographetus rama, recorded previously in Singapore, should be looked for. It is highly likely that there continues to be discoveries or re-discoveries in our Singapore's forests where rare species have eluded observation till now. Many of these species may be cryptic in appearance, with several species looking very similar to each other. The skippers, in particular, the brown ones, tend to be difficult to identify from a single field shot and specimens may need to be collected to establish the ID of the species with greater certainty. Note : The English Common Name of Zographetus ogygia follows the Butterflies of Thailand 2nd Edition by Pisuth Ek-Amnuay. 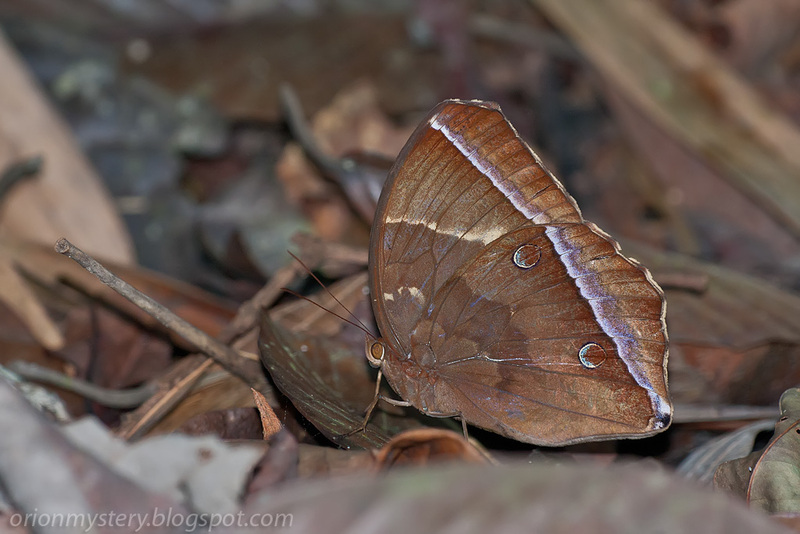 Elsewhere it is known by other common names but we will accept the Southeast Asian name as "Rusty Flitter". Great information, Khew! I would have thought that the Tirumala septentrionis septentrionis would have been included in the checklist ages ago. Guess as you said it could have been easily missed as it resembles the other Tigers. I hope this finds you and yours doing well. 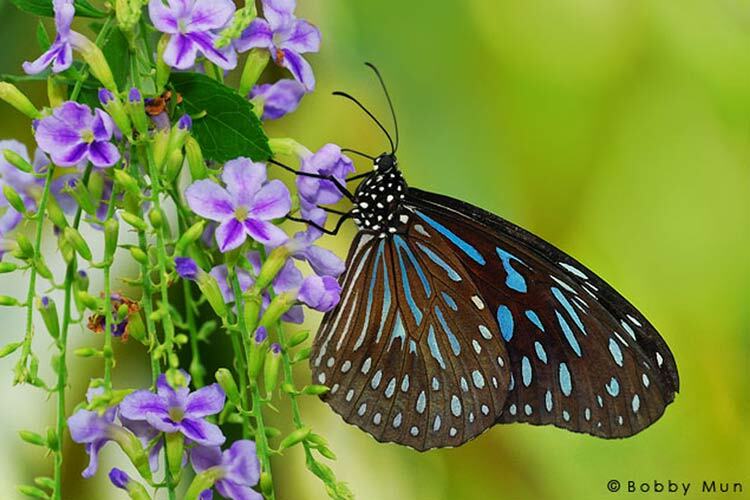 Butterflies of Singapore has been added to our new Site Directory, SiteHoundSniffs.com under All, Insects/Reptiles, Photography, Scholastic/Sciences and Singapore. In essence, SiteHoundSniffs is just like a grander blogroll or favorite sites list. Please email me at jerryebeuterbaugh@sitehoundsniffs.com if you want more details or the site removed. I am sorry for failing to find a way to contact you privately. Khew SK, i just know i've always loved the quality of your photos. And they always make me envious. Receive my congratulations on that very interesting blog. Greetings from Asturias (Spain). Thanks for visiting this blog regularly, Andrea.